Proton transfer and rearrangements are 2 more common mechanism patterns you will face in organic chemistry. This is in addition to Nucleophilic attack and Loss of Leaving Group discussed in Mechanism Video Part 1. You’ll see multiple proton transfer examples in action including turning a bad leaving group into a good leaving group! 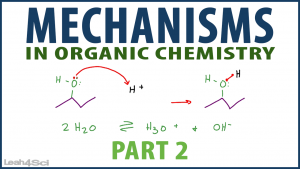 Rearrangement mechanism are broken down for a step-by-step comparison of stability to explain WHY hydride shifts or methyl/alkyl shifts occur to facilitate carbocation stability! This is Video 2 in the Mechanisms Series. Click HERE for the entire series.